Taj Mahal is one of the seven wonders of the World and is one among top tourist sites in India. Taj Mahal is situated at Agra in Utter Pradesh state, India. Taj Mahal, Agra, India – Photo By – George T. George (Self). Taj Mahal at Agra is a World UNESCO Heritage Site and the ultimate sign of expression of Love on earth. TajMahal was built by the Great Moughal Emperor, Shah Jahan, around 450 years back, in memory of his third wife, Mumtaz Mahal. Taj Mahal is considered as the best of Moughal Architecture and is a white marble mausoleum, on the banks of the holy river, Yamuna. The tomb is the main attraction of the Taj. Tajmahal is a UNESCO world heritage site. There is a beautiful garden in Charbagh style in front of Taj. Charbagh is a quadrilateral garden based on the four gardens of Paradise, as described in Quran. Ustad Ahmad Lahori, a Persian architect, is believed to be the chief architect of the Taj Mahal. It is said that Shah Jahan chopped off his hands to avoid him designing another monument like this! Emperor Shah Jahan was dethroned, stripped of his regalia and imprisoned by his third son, Emperor Aurangzeb (reigned from 1658 till his death in 1707) , after along drawn power struggle, including battles between himself and three of his brothers. Shah Jahan had to confine to the walls of Agra Fort on the banks of the holy river, Yamuna (close to Taj Mahal). Shaj Jahan spent rest of his lifetime at the Agra Fort, overlooking the Taj! Seeing Taj Mahal on a full moon day is a splendid sight, which you will cherish for a long time and can never be expressed in words. You can take photographs in the front side entrance near the garden, so that the snap looks like you are touching the top of the tomb! There are people who takes you the snaps for a small charge like Rs 30 or so on your camera. There are also professionals who takes snaps for a minor charge like Rs 300-400 or so for 2 or 3 snaps and get the physical photos delivered to you in 20 minutes or so. They will tell the land mark and ask you to wait there. These rates may vary person to person and client to client. Please check the rates before going in for the photo shoot. TajMahal was recommended for ‘New Seven Wonders of the World‘ in 2000 as part of a Millennium Project and was declared as a winner in 2007. Are you are interested in a virtual tour of Taj Mahal? Taj Mahal Tour is part of Golden Triangle Tour Packages in India. Are you interested in golden triangle India tour package covering Delhi, Agra and Jaipur? Please check with your travel agent for details on Golden Triangle Tour package prices. Taj opens at 6 am and closes on 7 pm except Fridays. Taj is closed on Fridays . On Fridays, Muslims can pray here at Taj Mosque; from 12 noon to 2 pm. Taj is open on nights during the full moon day and two preceding and two subsequent nights. Thus it is open on 5 nights in a month for tourists. Taj is closed at night during the month of Ramadan. Indians need to buy entry tickets costing Rs. 40/- and foreigners need to pay Rs. 1000/-. Those who book online ticket for Taj Mahal will get discount of Rs.5/- per Indian ticket & Rs. 50/- per Foreigner ticket. From January 2018 on-wards, there is a proposal to limit the number of Indian tourists at 40,000 per day. Once this number (40K per day) is crossed, Indian tourists needs to pay Rs. 1000/- as entry fee to visit Taj. On Deepavali and some other festival days, the number of Indian tourists exceed this number. It is reported that 1.5 lack Indians visited Taj, on a Deepavali day. How Do I Go to Taj Mahal, Agra? Agra, in Utter Pradesh state of India, is well connected by roads, trains and flights to the rest of India. It is around 2 hours drive from Delhi, India. Many National highways passes through Agra. Delhi-Agra Yamuna Expressway is the best one, connecting Agra with India’s Capital, New Delhi. Traveling by this route normally takes around two hours time. NH 2 also connects these two cities; but takes more time than the other paid expressway, mentioned earlier. NH 91 connects Aligarh with Agra. NH 11 connects Agra with Jaipur, capital of Rajasthan state. NH 3 connects Agra to Mumbai, the commercial capital of India. NH 2 connects Agra with Lucknow, the capital of Utter Pradesh state. Indira Gandhi International Airport in New Delhi is the closest major international airport to Taj Mahal at Agra. Agra Cantonment railway station is the nearest major station to Taj Mahal which connects Agra with Delhi, Mumbai, Chennai, etc. Agra Fort railway station is another railway station near to Taj Mahal, which connects Agra with East Indian Cities like Kolkata (Calcutta) and other cities of Central India. There are many hotels in Agra catering to the needs of the tourists. 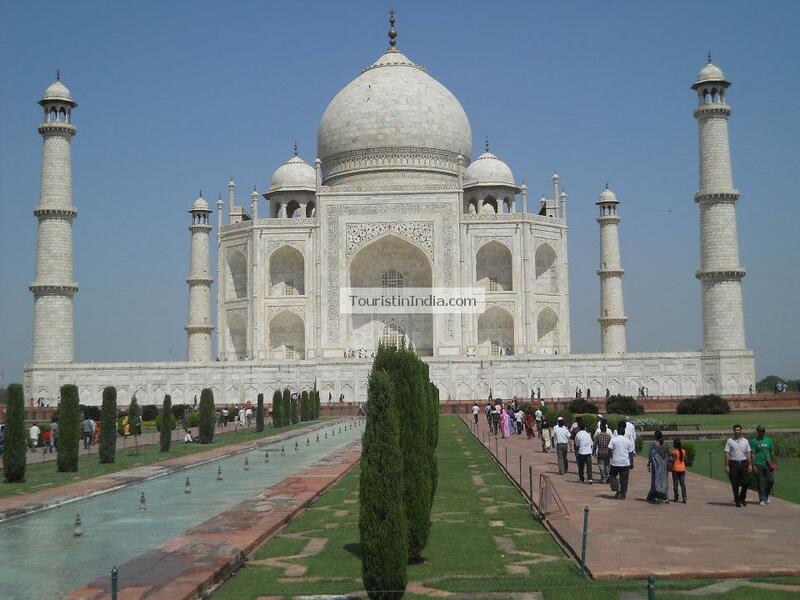 Taj Mahal Tour is part of Golden Triangle Tour Package in India. Are you interested in golden triangle India tour package covering Delhi, Agra and Jaipur? Please let me know your comments.